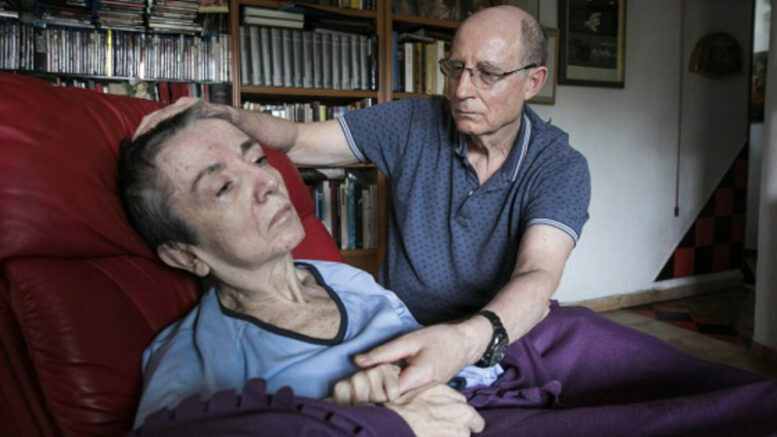 The arrest of a 70-year-old Madrid man for illegally having assisted in the death of his 61-year-old terminally ill wife has thrust the debate in Spain over the right to die with dignity into the political limelight, just weeks before the nationwide 28th April general elections. The arrest of Ángel Fernández by Spain’s Guardia Civil police for his role in the death of his wife, María José Carrasco, came after he uploaded video of the couple discussing plans for her assisted suicide to avoid further pain from multiple sclerosis, from which Carrasco had been suffering for more than three decades. Fernández, now free on bail while pending trial, is a former employee of the Madrid regional assembly who had taken early retirement to care for his wife, who had been awaiting assignment to a care facility for years, could not move about their home without the help of a special hoist and was reportedly in constant pain in the weeks leading up to her death. Euthanasia legislation has been proposed n Spain’s Congress on 15 separate occasions since 1993 but has always either been defeated or stalled in committee, usually through the opposition of the conservative Partido Popular (PP) and sometimes of the centre-left Socialist party (PSOE) , as well. But, despite PSOE opposition to euthanasia legislation in the past, Carrasco would have been eligible for hospice care and medically assisted termination of her life under a proposed right-to-die initiative sponsored last year by the PSOE government of President Pedro Sánchez, which appeared to be en route to approval after expressions of support from all parties except the PP. The Sánchez government’s proposal failed to clear the congressional Mesa Directiva (‘Executive Committee’), however, stalled by repeated objections raised by representatives on the committee of the PP and the centre-right Ciudadanos party. While the PP openly opposed the euthanasia bill, Ciudadanos said it was in favor of reaching agreement on the legislation — but nevertheless cast its votes on the executive committee to stop the legislation moving to through committees for debate and amendment and on to a vote on the full floor of Congress. Fernández and Carrasco had been expecting the legislation to be approved and after it failed to make it out of the executive committee before the dissolution of the legislature to allow for general elections, Carrasco requested that her husband assist in her death. Following Carrasco’s death and the arrest of her husband, PP leader Pablo Casado has reaffirmed that his party would not introduce euthanasia legislation in Congress if he is able to form the next government. Ciudadanos leader Albert Rivera said if he were to become Spain’s next president, he would work toward building a congressional consensus to pass a euthanasia law that could be agreed by all parties. The PSOE’s Sánchez, meanwhile, said he felt overwhelmed and outraged by the situation in which Fernández and Carrasco found themselves, blaming it on what he called the “blockage by a small minority” of his government’s proposed euthanasia legislation. While promising that if re-elected he would work to ensure the legislation’s passage, Sánchez expressed solidarity with Fernández and hinted he might consider a presidential pardon should the courts convict him of the murder of his wife.